Featured Designer - Merry Mondays! REALLY 2 in one day..? ---YES!!! join the Merry Monday Team for a MONTH of Merry Mondays! It really is a dream come true! So I will get right to it.. I paired them with a sweet little Santa stamp. That sweet grey ink is Memento London Fog. feel and let the other colors shine. I just LOVE the modern and vintage mix of this. Pretty FRESH. 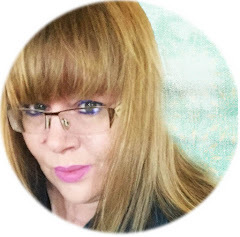 Featured Designer - Merry Monday! That you will proudly and happily deliver! and if you do - you surely will be delighted!! Oh yes, very fresh - love it! Congrats on The Concept too!!!! You are smokin' it, friend! Congratulations on your announcements! So happy for you. Love your sweet card. Fabulous card, so glad you have joined us as a featured designer this month. Your card is absolutely adorable! So happy you could design for MM this month! love the mix of trad & modern too. Brilliant card Kimberly, you're flying at the moment! Such a cute card, Kimberly! 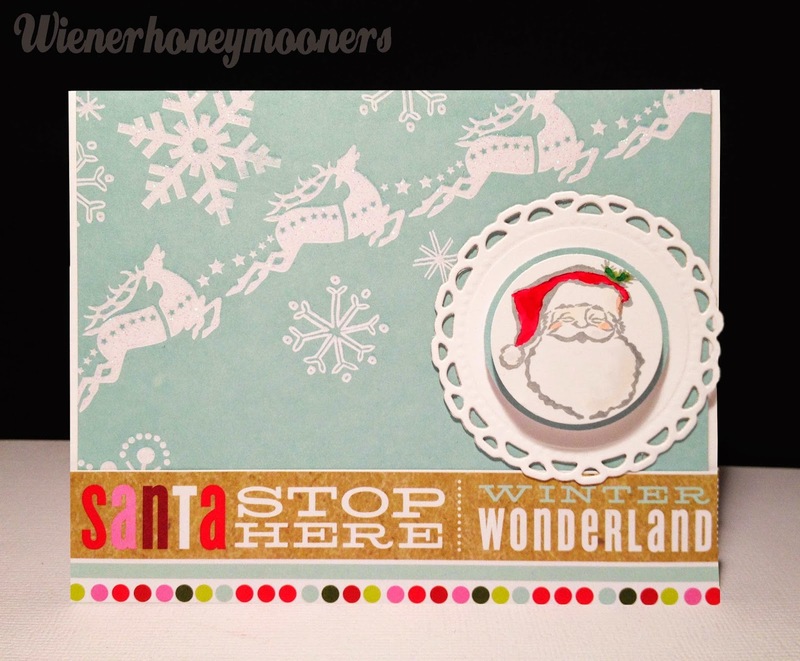 Just love your sweet Santa card! So excited to have you joining us this month! I'm so excited that you are joining our team this month, Kimberly! And you've started off with a fantastic card! Love that Santa and the paper is perfect! This is such a cute card! That DP is perfect with your Santa image & sentiment!! A totally adorable card, I'm going to have to use your stamping in gray technique - it's so simple and so smart! So glad to have you as our Featured Designer this month, woot woot! It's so great to have you on the team this month. Your card is perfect for the challenge - I love the soft and subtle background with the bright pops of color. Well of course they are all snapping you up! They know you are loaded with talent and inspiration!!! So happy for you, and yup, I love the card!!! Great card, Kimberly - love the vintage feel! So happy to have you as our Featured Designer at Merry Monday - yeah!! THE CHALLENGE #10..and a Tip! Paper Crafting Challenge 13: "Anything Goes!" Hello, Ni Hao, Buenos Dias? Merry Monday #114 - Sparkle, Shimmer and Shine! Winner - CASology Designer Feature BLOG CANDY!!! 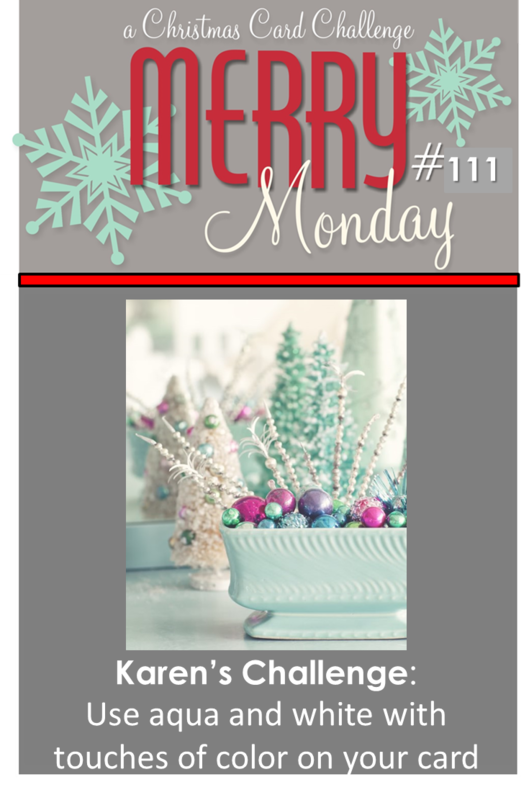 Merry Monday #113 - Pink, White and Silver! CASology - Design Team Feature! Paper Crafting Magic - Challenge 12: "In Summer"
CASology - Cue Card ? Dad you are a WINNER! CASology - #99: Anniversary ! Merry Monday #112 -Add a Santa Hat! THE CHALLENGE - More Delights! CAS(E) this sketch! - Hello! CASology - #97: Shine ! The MALE Room - Leaves and Trees!